we bake fresh daily and we use only the finest and fresh ingredients. All are made the old-fashioned way with love, patience and consistent dedication to the highest quality. While our Custom Decorated Cakes are renowned, we bake much more - layer dessert cakes, cheesecakes, award winning pies, cookies, brownies and other bars, pastries, our ever popular cake squares and other delicious treats. Come and take a look at our beautiful Custom Wedding Cakes. 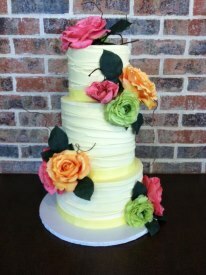 We have over 33 years of experience which includes a Master Baker, a Pastry Chef and Experienced Custom Cake Decorators. We take pride in the products we bake. We are conveniently located on the corner of Thompson Lane and Medical Center Parkway across the street from Middle Tennessee Medical Center. We are multiple “Ruthie Award” recipients in several categories including “Best Bakery” and “Favorite Desserts”. The “Ruthie Awards” are decided by you, our faithful customers.